The Cyclades is a group of 33 islands spread across the Greek Aegean sea. Their name has its supposed root at the Greek word kyklos (meaning circle) and was attributed to them during ancient times seeing as they circled around the sacred isle of Delos island -Apollo’s birthplace. The Cycladic islands are mostly rocky and weathered by the Meltemi winds and known for their picturesque white-washed houses as well as the infamous Greek gastronomy and the temperament of their people! The Cycladic climate is akin to the Mediterranean with temperatures ranging from 22-28 ℃ (72-82 F). The wind prevailing around the Cyclades, especially during the summer months (July & August), is known as Meltemi (a loan from Italian mal tempo, meaning bad weather) but it was known as etesian in ancient Greece, meaning a yearly wind. The meltemi forms daily in the Aegean when high pressure forms over the Balkans and low pressure forms over Turkey. They are usually about 6-9 Bft and die out after dusk. The meltemi breeze protects the Cyclades from summer heat waves and is usually pleasant –especially when it doesn’t blow the hat off your head! As with most Greek islands, the Cycladic marinas are relatively small in size, but they do provide the basics: water and fuel. Registering at the Port Authority, usually costs approximately €2. The most cost-effective method for water and fuel supplies requires an additional 2 euros for the purchase of a card that provides you with 150lt of water or 2KW of electricity. On some islands (like Syros) these prices may be a little higher. During the summer months (especially July and August) you should approach the marinas for berthing very carefully especially during the high season when the visitors' berths are lesser. Furthermore, you should always take into account the Meltemi winds, depending on the location and orientation of the marina. The Meltemi winds are usually the biggest obstacle to mooring. However, rest assured that, especially during bad weather, several people around the marina will be keeping an eye at your effort and will certainly come to your aid with a wave of your hand. Avoid trying to be the hero and always ask for help if you need it but don’t forget to give back! If there is no free space at the marina you have birthed, allow newcomers to tether on you, explaining the rules about silent and careful crossing over your deck. Solidarity on Cyclades is a very useful thing! 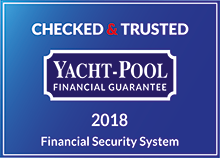 Berthing your boat to the docks of the Cycladic islands should not worry you in the slightest as there is no history of crime related to sailors or boats. Generally, it is best if you make it a rule not to spend the night in desert bays, unless there are other boats around you. More important than crime, a thing to watch out for around these islands, especially during the evenings, is the wind dragging your anchor away! The magical thing here is that every island has its own character and each one is preferred by birds of the same feather! So if you’re interested in the hectic Aegean nightlife you should definitely opt for Mykonos or Ios, while those who want quiet family holidays will find a better match at Andros or Milos islands. Tip: In the large Cycladic islands, we recommend renting a car so you can experience at your leisure the beauty of the islands, their beaches, their museums and of course their special delicacies (we hope you’ve got the Foursquare app on your mobile)! Known for its museum of modern art as well as the Sariza spring whose water is often paralleled with the famous Evian water with regards to its quality. One of the most quiet islands around the Cyclades, Tinos is a popular religious destination with the church of Our Lady Mary being its pole of attraction. A very low-key island and the favourite destination of scuba diving lovers! Its marina is located at Korissia and has a limited number of berthing places. A peaceful island with sandy beaches. It has 2 marinas: Merichas and Loutra (there is a hot spring that you can swim in at the entrance of the marina!). At Kolona bay, many boaters drop their anchor to enjoy night-swimming and a rest under the stars! Known for its many towers and churches, Serifos is where the mythical hero Perseus supposedly returned, carrying the head of the gorgon Medusa! A very beautiful island that you should definitely include in your trip to the Central Aegean islands. Especially interesting for its gold, silver and lead deposits, the Sifnians are rumored to have been especially rich –storing most of their gold at the treasury of Delphi! At Sifnos, you can berth at Kamares (a port at the west coast) or better at Platis Gialos (south) in front of a very long and sandy beach! One of the most beautiful Cycladic islands, Ios is known for its nightlife and is a pole of attraction for young ages. The marina provides easy access. A modest island with permanent fans! Caution when attempting to berth at the marina, since the northern winds coming from your right will have you in a pickle! Although the marina is relatively isolated you can easily hop to the island’s center by bus or taxi. There you will discover a magical place, brimming with delicious flavors and an endless view of the sea! A volcanic island with rich history and also the place where the Venus de Milo was found (now in the Louvre)! Today, Milos is a pole of attraction for history buffs who enjoy beautiful, sandy beaches! Famous for its hectic party life, this Cycladic island with its Ibiza vibe is the favorite destination of celebrities and VIPs worldwide! The center of archaic Cycladic civilization and famous for its source of emery, Naxos is a heaven for kite and windsurfing aficionados! The island has over seven sports clubs that offer both of these activities! Known in antiquity for its fine marble, Paros is only a few hours away from the port of Piraeus and notorious for its valley of butterflies –a sight you should not miss in your tour of the Cyclades! Once possessed by the infamous pirate Barbarosa, Syros played a critical role in early Cycladic civilization. Now known for its local Greek delicacies, Syros is an ideal destination for family vacations! This famous volcanic island was voted the Top Destination worldwide for 2017! With its rich history and mythology as well as its cosmopolitan character, Santorini is sure to leave you with a sense of enchantment! 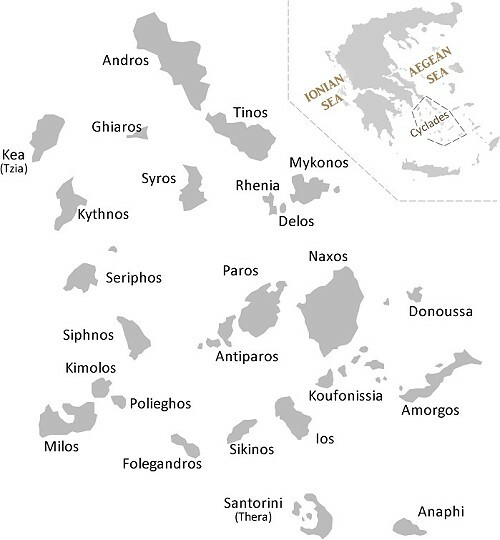 The small archipelago of the Lesser Cyclades can be found south of Naxos, and includes the islands of Ano Koufonisi, Kato Koufonisi, Donoussa, Schoinoussa, Irakleia and Keros (this last is inhabited). 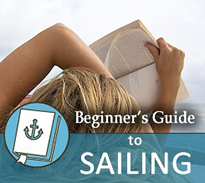 Sailing around the Cyclades is best suited for experienced sailors and for anyone traveling on a skippered boat! With the Cycladic civilization having had such a critical impact on the Greeks of the mainland, sailing among these islands can make one feel as though they’re at the source of Greek culture and its history, mythology, architecture and multiform arts. Best described as a travel through time, the seaman will emerge into the modern Greek temperament with its delicious gastronomy and heated nightlife! Sailing off season between the children’s school holidays and outside of the times the meltemi wind is at its fiercest you can consider a less conservative route. As long as you bring your boat back intact and on time the world is your oyster!